People carry what they can during an evacuation of Vanport as Columbia River floodwaters pour into the town just north of Portland from a broken railroad levy on May 30, 1948. Soon the entire town would be washed away. The Vanport Mosaic project is sharing oral histories from of life in Portland during the time and over the course of Portland’s African –American history. Using archival footage, historic photographs and compelling first-person narratives, the Vanport Mosaic invites the community to join them for a free screening of oral history documentaries, part of a living archive that traces the story of Portland African American community from the 1940s to 1970s. If you attended the Vanport Mosaic Festival 2017, you might have spotted a silver Airstream trailer parked in front of one of the festival venues. 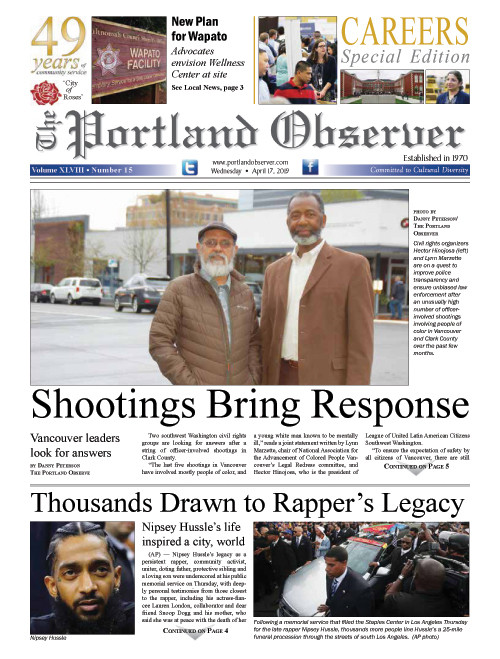 The promoters of the event said it was from there that a team of memory activists were busy inside recording the memories of life from people who lived in Portland at the time. It is a story of struggle, perseverance, and resilience that continues today. Organizers said you should be prepared to be inspired, moved, uncomfortable, confused, entertained, sad, and uplifted; possibly all at the same time. “A Place Called Home: From Vanport to Albina” will be presented for free on a first come first served basis on Sunday, Feb. 3 at 3 p.m. at the St. Johns Library, 7510 N. Charleston Ave.; and on Monday, Feb. 4 at 6:30 p.m. at the Albina Library, 3605 N.E. 15 Ave.